We rely heavily on voluntary donations to provide support, advice, training and activities to everyone who comes to us for help. All of our services are free of charge including food, drink and laundry services. Any donation no matter how small is greatly appreciated. As you can see from the list below, there many ways you can contribute. We desperately need your support to help us to change lives and help people out of homelessness. We are indebted to the people who have helped us to help others’ by their generous giving and support – we’re making a difference because of them! Shiloh Rotherham, CAF Bank Ltd, 25 Kings Hill Ave, Kings Hill, West Malling ME19 4JQ. This really makes a difference for us! You can boost your donation by 25p of Gift Aid for every £1 you donate. Click here to view our gift aid form which you can email or post back to us so that we can claim extra funds from the government. If you feel you could make a one-off or regular donation, or even do a sponsored challenge, please click on one of the Virgin Money Giving or Paypal buttons and donate any amount. Alternatively, please use your mobile phone and text ‘SHIL00 £5’ to 70070 (that’s SHIL then two zeros). 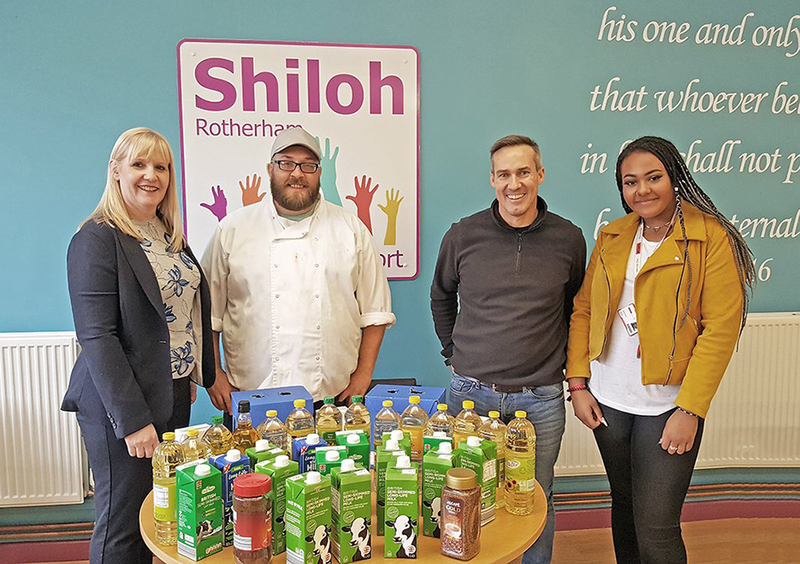 You can also send a cheque payable to ‘Shiloh Rotherham’ to 15 Station Road, Masbrough, Rotherham, S60 1HN. Our visitor reception is open to receive donations between 9.30am-2.30pm – Mondays, Wednesdays, & Fridays. See below for the list of items we need. If the item you want to donate is not on our list, then either we are well stocked or do not currently require it. Clothing – We welcome good condition clothing, bags, shoes; trainers. We keep a stock of clothing for our guests to have if they need it, and the rest we look to sell to raise money to cover the centre’s running costs. We do not currently need tinned beans, soup or pasta., but if you would like to donate these or other food items, please consider supporting the Rotherham Food Bank which is a lifeline to many local people in need. Household goods – We are currently fully stocked with sleeping bags, blankets, pillows and sheets. Brand new single or double duvets are welcome. Toiletries/Cleaning/Consumables – We are well stocked for male and female toiletries and sanitary ware, but we do often need: 1) Disposable Razors & Shaving Foam 2) Toilet Rolls & Kitchen Roll 3) Heavy Duty Bin Bags 4) Floor Cleaner Solution 5) J-cloths.